Nashville based artist, Lisa Garcia is making me feel nostalgic. 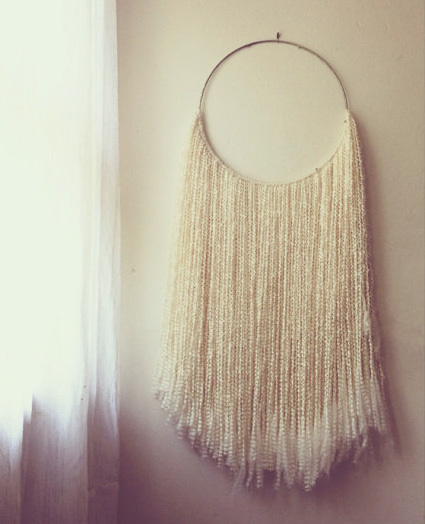 Her handmade wall hangings make me pine for those macrame plant holders my mom had in the 70's. Macrame is back in trend and I particularly like Lisa's unique twist to the artform. Lisa uses metal and a wool blend fiber for her pieces, which all stand on their own as one of a kind. Lisa, "It started as a hobby and an exploration of materials but has since grown to be one of my main undertakings. With each piece, I experiment with texture, weight and shape and the results are what I consider to be a modern take on folk fiber art." Each one is just so lovely, it makes me want to have a crafting night with friends...hmmm, maybe someday soon. In the meantime, find inspiration and some lovely home decor ideas in her Etsy shop, Sonadora.